The challenges that face the RCE Severn region in the next few decades also bring opportunities to advance on sustainability. 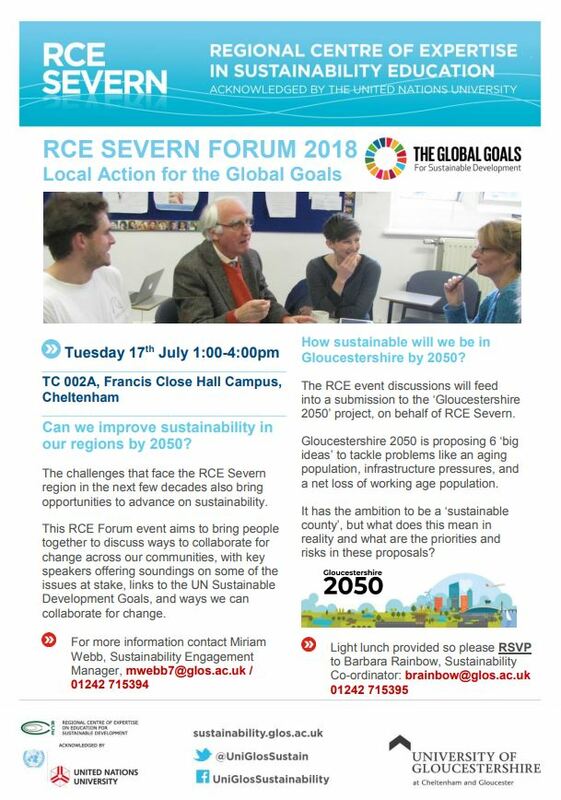 You are warmly invited to join our RCE Severn Forum to explore how we can improve sustainability in our regions by 2050. The Forum aims to bring people together to discuss ways to collaborate for change across our communities, with key speakers offering soundings on some of the issues at stake, links to the UN Sustainable Development Goals, and ways we can collaborate for change. Discussions will feed into a submission to the ‘Gloucestershire 2050’ project, on behalf of RCE Severn. Find our more on our event flier.